Push the “-” button A to decrease the brightness of instrument panel lights when driving at night. 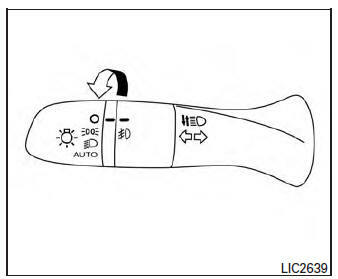 Push the “+” button B to increase the brightness of instrument panel lights when driving at night. Move the lever up or down to signal the turning direction. When the turn is completed, the turn signal cancels automatically. 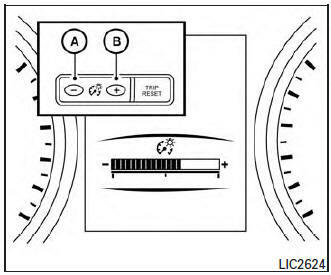 To signal a lane change, move the lever up or down to the point where the indicator light begins to flash, but the lever does not latch. The turn signal will flash three times automatically. To turn the fog lights on, turn the headlight switch to the position, then turn the fog light switch to the position. 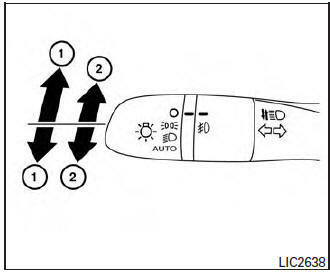 To turn the fog lights on with the headlight switch in the AUTO position, the headlights must be on, then turn the fog light switch to the position. To turn the fog lights off, turn the fog light switch to the OFF position.